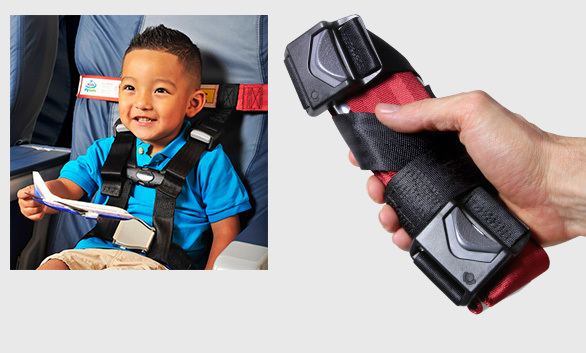 The AmSafe Child Aviation Restraint System (CARES) is designed specifically for children. The AmSafe Child Aviation Restraint System (CARES) is the world’s first and only aviation alternative to a car seat. CARES is an innovative belt-and-buckle device that attaches directly to the airplane seatbelt. Adjustable to fit virtually any size of airplane seat, CARES is FAA certified for children weighing between 22 and 44 pounds occupying their own seat. Passengers with children can now check the bulky car seat through as luggage and take CARES on board. CARES restraint weighs less than one pound and easily fits into a small carrying bag. This child restraint provides an easy and effective solution for improved child passenger safety. CARES is the first alternative aviation child safety device to be certified by the FAA for all phases of flight – taxi, take-off and landing. If you are interested in purchasing CARES for personal use, please visit www.KidsFlySafe.com. "Finally, an aircraft restraint designed specifically for children."